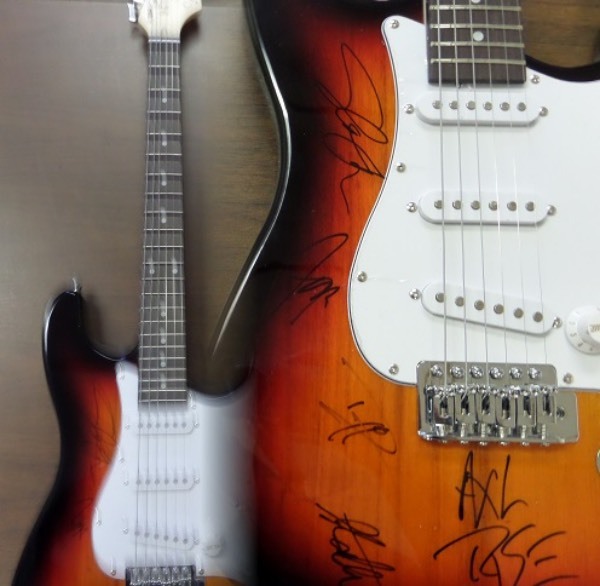 Coach's Corner - Guns N Roses BAND-SIGNED/guaranteed Electric Guitar by ALL 5 ORIGINAL guys! Go Back to Lot List Guns N Roses BAND-SIGNED/guaranteed Electric Guitar by ALL 5 ORIGINAL guys! This GORGEOUS black and brown electric guitar is in mint shape and comes signed by ALL 5 original band mates in black sharpies. Comes in original box with carry bag, cords, etc. included and signed by AXL, SLASH, DUFF, IZZY, & STEVEN(very rare to have Steven sign this) ! Retails well into the low thousands and RARE with the main 5 guys. WOW! !